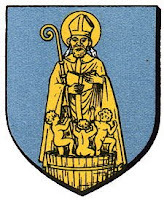 Anyway, there are a number of coats of arms with a depiction of Saint Nicholas on them. 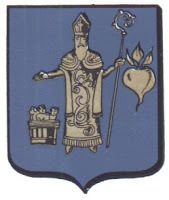 The two shown here are the arms of the towns of Ergersheim, France (on the left) and of Waal, Germany. 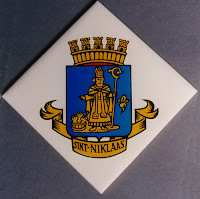 Finally, and my favorite of all of them, are the arms of Sint Niklaas, Belgium (shown here in two variations; the one on the tile comes from the Saint Nicholas Center's website at http://www.stnicholascenter.org/Brix?pageID=46). I'm not sure about the turnip. 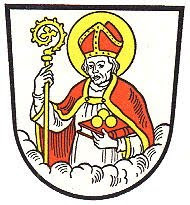 I have to assume it has less to do with Saint Nicholas than it does with the town or region in which Sint Niklaas is located. The object is a beet, the story goes that the emperor Charles V came to the town and that a farmer wanted to present him with a beet the emperor rewarded the farmer with a purse. Seeing this a local horse breeder imagined that if he presented a horse to the emperor he would get a big reward. He presented a horse and the emperor said that he would pive himone of his most priced possesions and gave the beet to the horse breeder.